Soothe and protect your face. 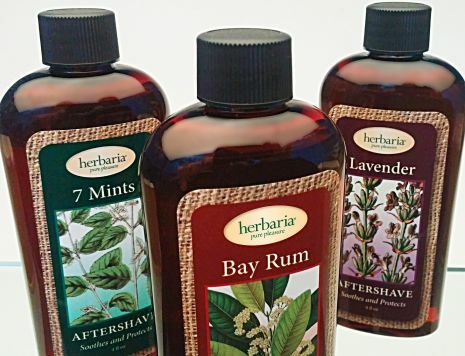 Herbaria Aftershaves do not compare to those typical, overly perfumey, stinging, drying, often irritating concoctions called aftershaves, but what else could we call this product to apply after taking a razor to one’s face? Herbaria Aftershaves condition your skin to make your face feel great for hours even after the closest shave. They smell irresistible from essential oils, not irritating synthetic fragrance. Our aftershaves contain simple, natural ingredients. Witch hazel—an astringent that helps close pores, tone, and protect your skin. We use witch hazel hydrosol, superior to commercial witch hazel preparations. Hemp seed oil—a nutrient-rich moisturizer to soothe your skin without clogging pores. Aloe vera—an antioxidant to help heal skin and reduce inflammation. Glycerin—a humectant that attracts moisture to your skin. Denatured alcohol—an antiseptic to prevent infection. We do not use synthetically-produced alcohol. Instead, we use grain alcohol denatured (made undrinkable) with lavender essential oil. Vitamin E—moisturizer and natural preservative. The first thing you’ll smell when you sniff is the main ingredient, witch hazel. There is no better tonic or toner to put on your skin, especially problem skin. Witch hazel evaporates quickly, and the aromas of the essential oils emerge: manly Bay Rum, cooling 7 Mints, and classic Lavender. We don’t add emulsifiers or stabilizers that might irritate your skin, so before you use your aftershave, shake the bottle a bit to blend the ingredients. The Lamiaceae, or Mint family, is a remarkable group of herbs. Seven different genera of the mint family make 7 Mints a super aftershave. The genus Mentha includes Mentha × piperita, peppermint. The peppermint will cool your skin after your shave. Six other mints combine to make this unique and beautiful herbal scent. They include rosemary Rosmarinus officinalis, marjoram Origanum majorana, clary sage Salvia sclarea, basil Ocimum basilicum, lavender Lavandula angustifolia, and thyme Thymus vulgaris. Bay Rum is that spicy scent from the West Indies. The West Indian bay is related to allspice. Citrus is another component of the classic fragrance, and we've included petitgrain. That essential oil comes from the twigs and leaves of the orange tree and poses no photosensitization problems, common with citrus oils, for your skin. It also adds a pleasing complexity. To round out the scent, it has a bit of clove. Lavender is the major component of this aftershave. It is equally appealing to both men, like Frank Sinatra, and to women, who shave many more square inches than most men. To give it a pleasant earthiness, we add intensely aromatic spikenard essential oil. Enjoy! Each bottle of Aftershave counts as 1 bar toward our free bar offer. Start your shave with these moisturizing, creamy shaving soaps.